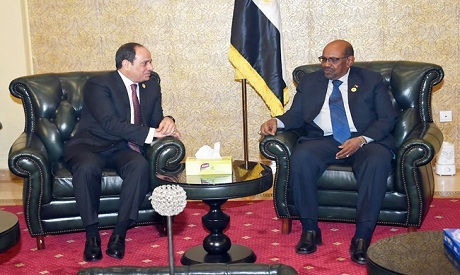 Egypt's President Abdel El-Sisi met with his Sudanese counterpart President Omar Al-Bashir in Addis Ababa on Saturday evening on the sidelines of African Union summit, the Egyptian president's office said. The two presidents discussed recent developments in the region, as well the ways to boost bilateral relations between Egypt and Sudan, according to a press release. During the meeting, El-Sisi and El-Bashir agreed to form a joint ministerial committee to deal with all outstanding bilateral issues and challenges. On Friday, Egypt's Foreign Minister Sameh Shoukry met with his Sudanese counterpart Ibrahim El-Ghandour, also in Addis Ababa. According to the Egyptian foreign ministry, Shoukry and El-Ghandour aimed to clear up any "misunderstandings" that had resulted in tensions in recent months. Sudan recently recalled its ambassador to Egypt for consultations without citing an official reason or revealing when he might return. Relations between the two countries have been strained in recent months due to Sudan’s claims of sovereignty over Egypt’s southern Halayeb Triangle region, as well as the Sudanese stance in the talks on the Grand Ethiopian Renaissance Dam. El-Sisi said earlier this month that Egypt does not interfere in other countries’ affairs, and has no intention of fighting its brothers in Sudan.